As many new writers discover, writing a book is just the first step in the career of writing. To really make an attempt at becoming a full time writer you have to have enough sales to either pay your wages or attract a traditional agent or publisher. Here at Australian eBook Publisher we assist writers to self-publish ebooks. As part of our aggregation contract we ask that our authors inform us of their marketing activities. This is so that we can maintain information about ebook sales and encourage others to copy successful tactics. Reducing the price of the ebook edition appeared to result in a tiny surge of activity, judging by the book's appearances in one or other of the 'top 100' lists of Amazon. The ebook has received its first review (positive) on Amazon. Attached for your information is a marketing flyer produced by the paperback publisher intended for retail outlets in Australia. It doesn't refer to the ebook, unfortunately ... I should have been quicker to pick that up. I will do so with a revision once 'Cruising Helmsman' appears (see below). The July edition of 'Cruising Helmsman' magazine - the leading masthead among such publications in Australia/New Zealand - is scheduled to carry a review of In the South. The editor told me it would very positive. I have accepted an invitation to do a book talk/signing at the Williamstown Literary Festival in Melbourne on Thursday 30 May. My inclusion on the four-day program has resulted in another radio interview request prior to the Festival. 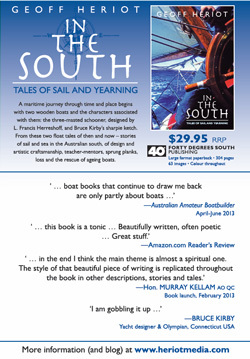 On 31 May I will also be doing a dinner speech/signing at the Royal Yacht Club of Victoria, also at Williamstown. The book has prompted ABC Radio in Tasmania to run interview/talkback segments over three successive weekends on topics arising from one or other of the chapters. That is also good exposure, albeit in a limited market. Hopefully all this will gradually build momentum. Please go to our Quote Request page to start the process of converting and/or aggregating your book.